We had a great meal here on our first day in Paris last month. We were pretty jet lagged and I had to work the next morning but we were rewarded for making our way over for dinner after a 3-hour afternoon nap. Food, wine and service were all notable. I really loved this soup. Because a trade show takes me to Paris, I'm always there in October and one of the best things about being there in October is that it's mushroom season. Excellent, hearthy bread which came in handy in the sopping up of upcoming sauces. Loved this rich, unctuous brick of really flavorful terrine. 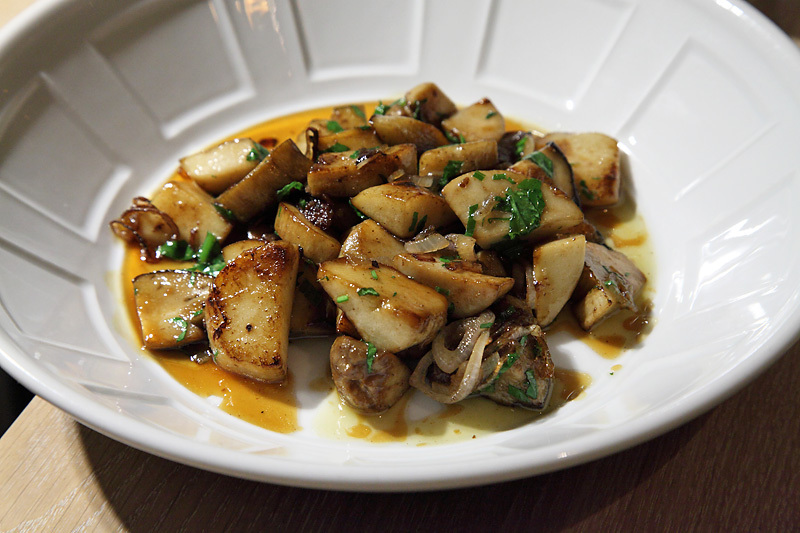 Just cannot get enough cepes. These were cooked really well, with a hard sear, some herbaceousness and a gentle bit of chew still on them. Earthy. Umami. Wonderful. They had a great list and some very expensive bottles but we chose this one, which was pretty near the bottom price-wise. 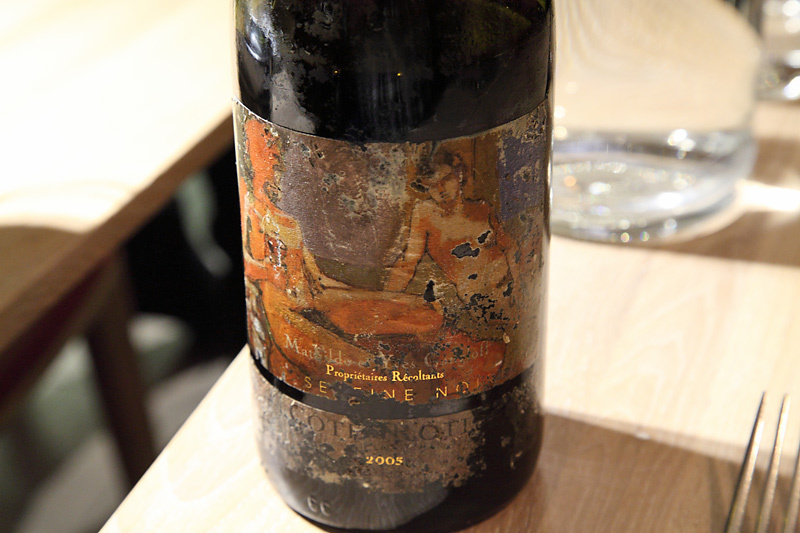 I really like Cote Rotie and this went pretty well with many of the dishes we ordered. Fwiw, they also had an excellent cellar that was viewable through a window in the floor of the dining room. I should have taken a picture of the deep orange, runny yolks under the delectable blanket of sauce. This dish was amazing. This had a fantastic, gelatinous, lip-smacking mouthfeel. 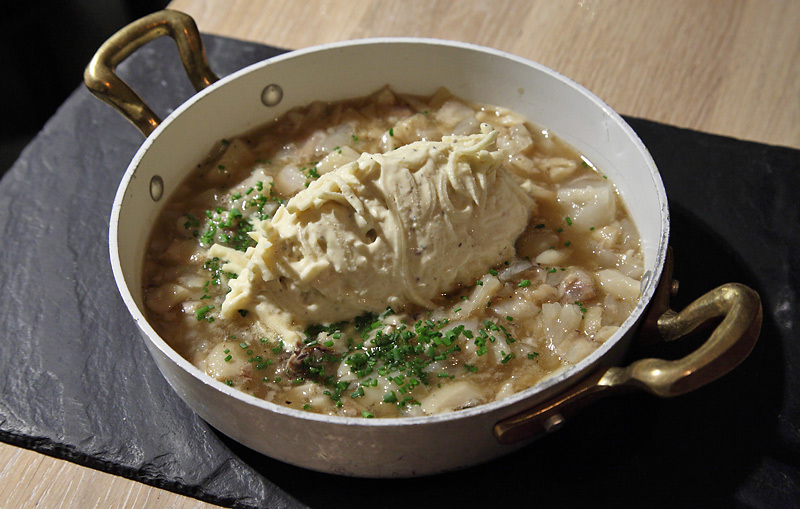 The skillet is filled with the soft and coarsely chopped foot and in the center is a beautiful quenelle of celery root salad dressed in a delicious remoulade. I really liked this dish but it had a bit more white pepper than I really wanted. 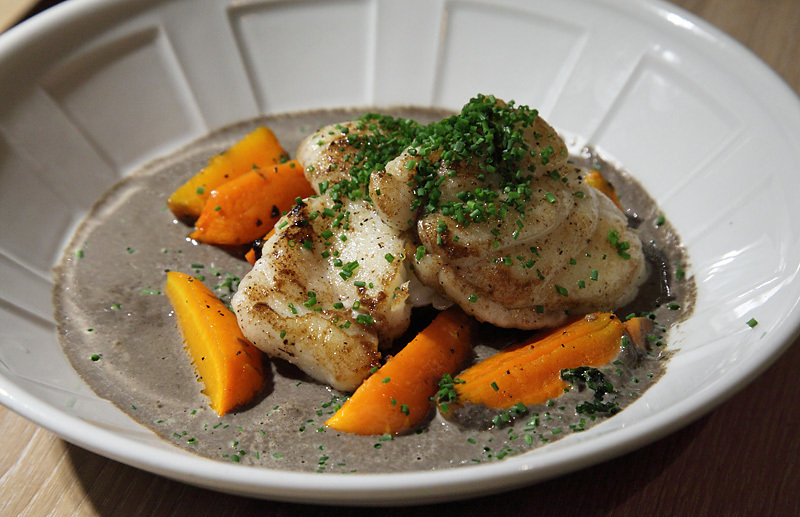 Perfectly cooked fish beautifully paired with some earthy carrots and black trumpet cream. I loved the flavors of this dish but this was too undercooked for me. And I get it. 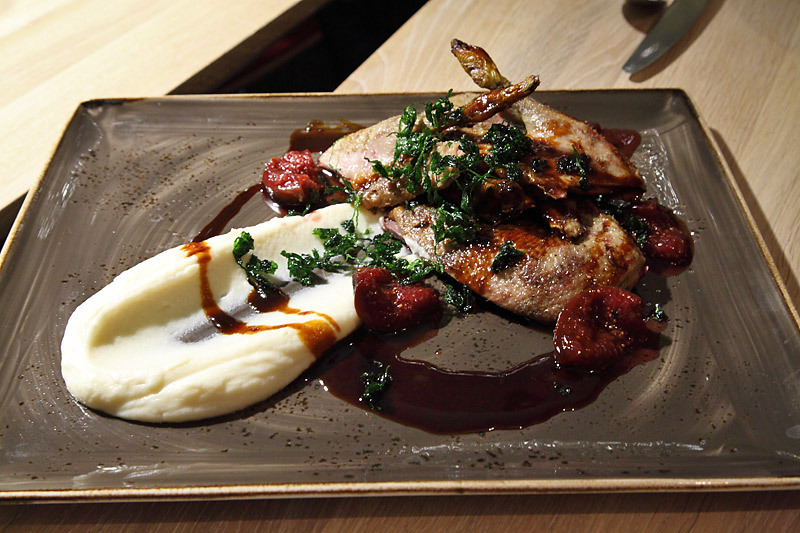 You don't want to overcook wild duck. This was no error. But this was so rare, it had a tough texture that actually made it hard to chew and even harder to separate from the bones. I'm guessing this was just lost on my pedestrian American palate because several other folks in the restaurant ordered it and cleaned their plates. A very nice finish - light and intensely flavored. We needed something sweet but had precious little room left. This filled the minimal void perfectly. I'd love to go back, properly rested, and really explore the menu and especially the wine list. On this night, we were so out of it, the experience almost felt a bit surreal. But it was clear this was a quality place and in spite of our condition, we really enjoyed the meal. Villaret was our favorite from a trip a couple years ago. Nice to see they're still on their game. The terrine in particular has stuck with me as a gold standard. 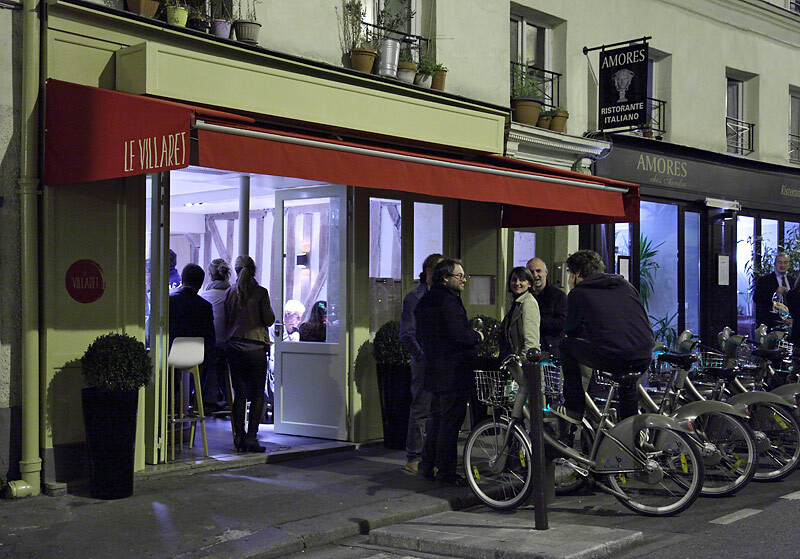 Great review/report of Le Villaret. We have a funny (and aggrivating) Villaret story. Between Christmas and NY not last year but the year before, we were headed to Paris to celebrate NY Eve. We had the concierge make us a number of reservations and one of them was for Le Villaret-not for NY but the day before. The day we were supposed to go to dinner, we had some delays, so we asked if they could make our reservation for 1/2 hour later. The concierge left us a message that all was good. So we cabbed it out there-we were staying near the Louvre so it was about a 20 euro cab ride there-and when we got there, it was closed for renovations. Luckily our cab waited and we just cabbed it back to the hotel to try to figure out where to eat. It turned out that the concierge got their voice mail and left a message to change our reservation and thought all was okay. So we ended up eating at La Rotisserie d'en Face http://www.larotisseriedenface.com/ which was lovely, but we've always wanted to go to Le Villaret. So, if we make it back there this year for NY, we'll go back! Thanks, and your photos are awesome! I keep thinking about your picture of the restaurant. It is like a French Nighthawks. Just stunning. We had a wonderful dinner at Le Villaret last night. 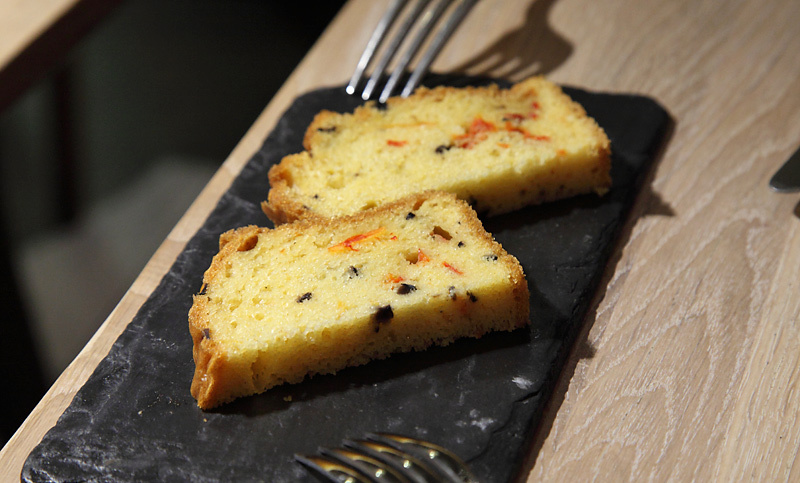 It certainly stands out for its adventurous and inventive menu, and I appreciated the range of options at different price levels. 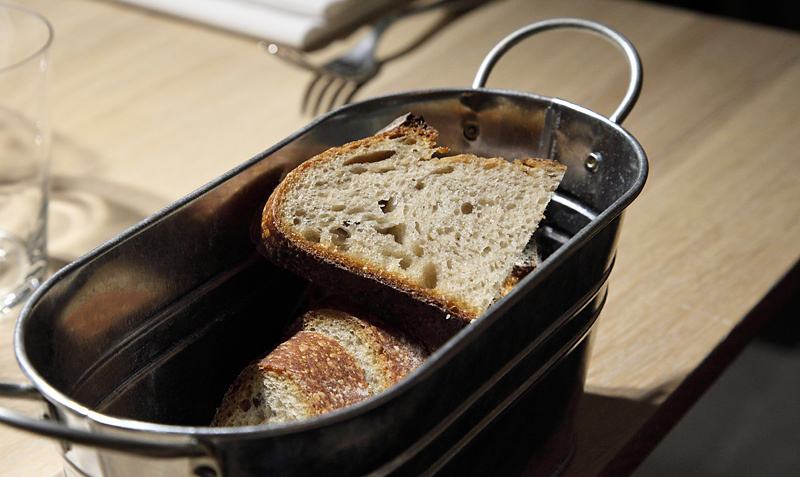 First things first: we have been in Paris since the beginning of August, and based on our experience, I would strongly advise visitors during this month to use an online reservation service like La Fourchette. There are certainly drawbacks to such services (they don't include all restaurants, they can be costly for the restaurant owners, and you're a bit more likely to find restaurants where other foreign visitors will also be). However, in a period when many restaurants rely on a hand-written sign in the window (yes, that's right, many restaurants post no such information on their website, or on their Facebook site) to announce when they are closed for August vacation, this will save you considerable frustration. We reserved and arrived at 8 pm to find a few tables occupied, but not many; more arrived toward 9. The restaurant seats about 50 people, and the owner (I believe) and one server took care of the service. 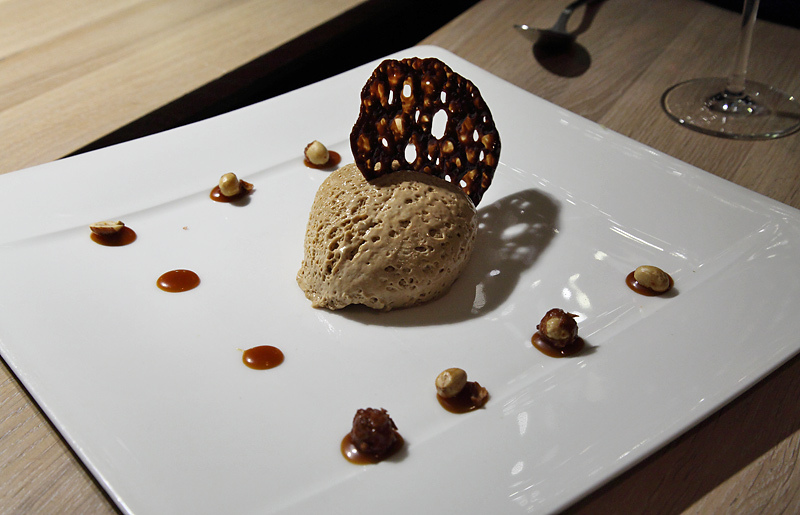 They offer two prix-fixe menus, one for 35 and the other for 55 Euros, both very appealing. 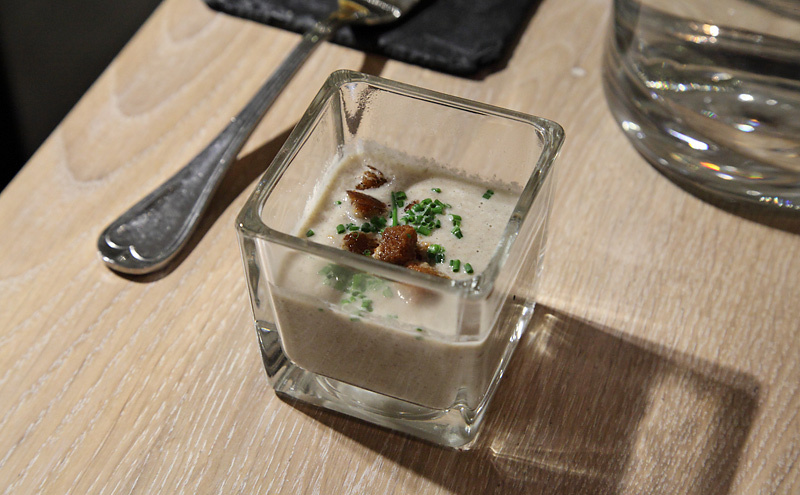 My husband took the 35 Euro menu, which began with a rustic terrine and onion tapanade. 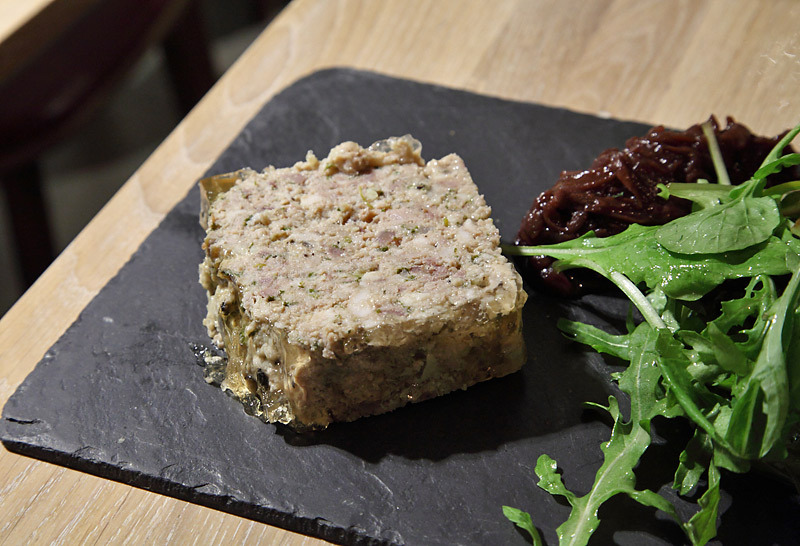 The terrine was the kind where the flavor of the liver comes through strongly, although the overall effect is balanced by the unctuous texture. I was seduced by the Breton-style artichoke and the cold lobster salad, so I ordered à la carte. My artichoke consisted of just the heart, served room-temperature on a bed of chanterelles, with a little field lettuce and vinaigrette, a few dots of hollandaise on the side. 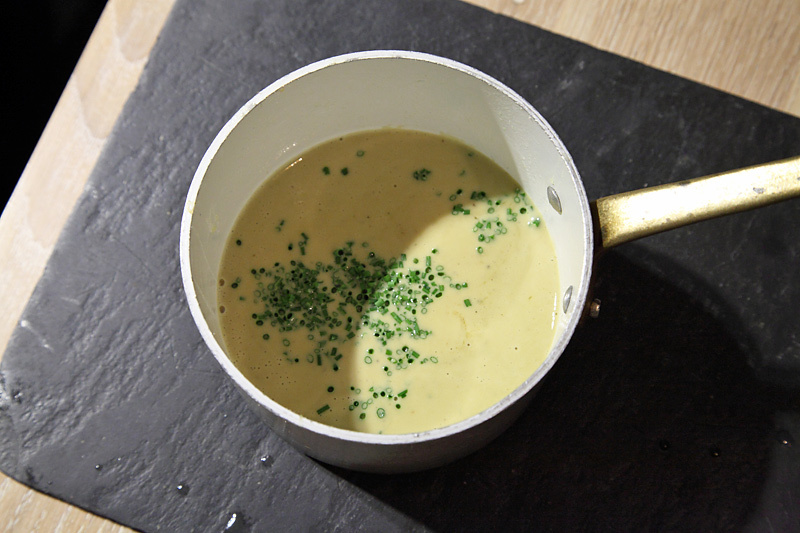 The slightly chewy chanterelles turned out to be a perfect complement to the very creamy texture of the artichoke heart. Our main courses were the Atlantic lobster salad, for me, and a seared filet of cod. Both dishes came with the most perfectly cooked white beans, very flavorful, not at all mushy (I cook white beans often enough myself that I wish I knew their secret). The cod, which was moist and flaky, sat on a bed of them. My lobster salad included a few mixed in with the greens. The lobster was very good and I loved the complement of tiny cooked green beans and little tomatoes. We finished with a dish of strawberries perched on lots of whipped cream for my husband and a feast of roasted mirabelle plums with a marvelous dollop of ice cream, and two cookies on the side, for me. The plums had been cooked whole, just enough to concentrate their flavor and focus their sweetness. We didn't venture into the depths of the wine list, but asked for advice and enjoyed a perfectly charming white Burgundy from Vincent Dureuil-Janthial. All in all, it was a perfect little dinner and we're already thinking of when we can go back again.